I am obsessed with these new coconut flour mini cheese loaves. There are just as good, if not better, than the cheesy muffins I used to enjoy with melted butter at a local cafe, during pregnancy number 3. The best bit? 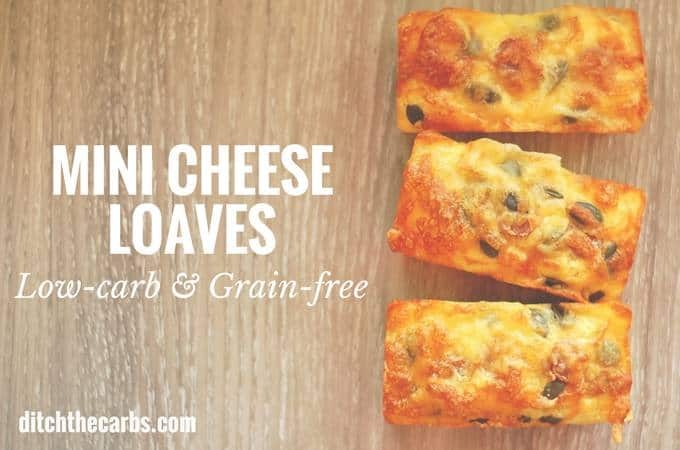 They are incredibly low carb (1.3g net carbs per loaf), grain free, gluten free and my kids LOOOOVE them. Too many low-carb bread recipes require almond flour, and for those who have been with me for a while, you will know I’m slowly preferring to use coconut flour over almond flour. Why? You can read the full post here. It all comes down to 3 really important differences between coconut and almond flour properties, health and cost. Coconut flour may be a little trickier to make with if you are a beginner but persevere because once you master coconut flour, the results are light, fluffy and much much lower in net carbs. I was going to write how coconut flour mini cheese loaves is the best bread recipe I have made so far and explain all the reasons. But you know what? I’m going to let the photos talk for me. Trust me, make them, serve warm with melted butter and there is no going back. Oh, and make sure you keep some for school lunches, pack them with a slice of butter in the centre. What a lucky kid! This is my first look at your site and it looks fabulous.. Greetings from northern Alberta, Canada! It would probably work, you may have to add some additional flavour and salt to make up for butter being omitted. I can’t wait to make them this coming weekend. 1 quick question please; it states medium eggs, how many will it be with large eggs? The recipe states 8 medium eggs, so maybe begin by using 6 large eggs. If it is still too wet, add a tablespoon of coconut flour at a time until it is the right consistency, OR if it is too dry, then add an additional egg. Just a question. Is it pissible to replace the coconut flour with lupin flour.??. and keep the rest of the ingredients the same. This looks amazing thank you for the recipe. I’m afraid I have never used lupin flour so can’t give you advice with confidence. If anyone does try this recipe with lupin flour, I’d love you to comment here and give some tips. Love this recipe! I added cooked onion and bacon and corn (non-lchf) they’re so good and I’m planning on making my next batch with sundried tomato, basil and feta! I made these and they are so good. I made two batches the first time. One w plain cheddar and the second with pepperoni cheddar cheese. We liked the plain but the flavored was amazing. I’m going to experiment w other varieties of cheese I have. Thinking horseradish would be awesome. Looks delicious! But I’m thinking cutting some of the saturated fat and adding complex carbs from whole grain wheat. Humans do need some carbs. Bob, I think you are n the wrong site if you want complex carbs and want to cut your saturated fat 😉 I hope you’re being ironic! Will these be OK served at room temperature for a potluck? Absolutely! And serve with plenty of room temperature yummy butter too. Has anybody substituted cream cheese for butter for even more cheesy goodness? I’ve been looking for something I can do for breakfast on the run – This is it! I would like to know how long these would last in the fridge? Should they rather be frozen? What a wonderful breakfast, and even better with some added spinach and even feta in the bread too. I would keep them in an airtight container in the fridge for up to 3 days. Coconut flour recipes don’t stay fresh for very long so if you want them beyond 3 days, then pop them in an airtight container in the freezer. All you need to do is remove one from the freezer before you go for a shower and it will be defrosted when you are finished. Can I ship these? And what’s the best way? Post them? I’m not sure how you could control the temperature and humidity so you can guarantee they will arrive safely and edible. Many postal/courier vans are notoriously hot and stuffy. 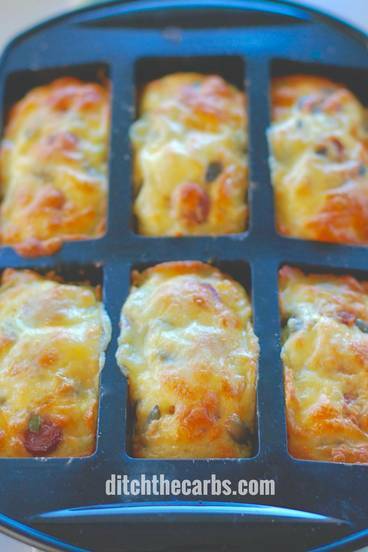 These mini loaves are high in eggs and cheese so ideally need to be kept cool. I keep them in my fridge in the summer and in my pantry in the winter. 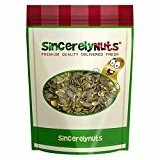 I always keep them in an airtight container too to make sure they are fresh. Thank you for including pictures of the finished product on your recipes when they are printed. Even a small picture is very helpful. Just starting to follow your page and have so many recipes I want to try. This might be my first one. If you have a way of making bread pudding low carb I’d love to hear about it. 😉 It’s my all time favorite dessert. Hello Sister Keen, what a great idea for an after service or service break treat. Can’t wait to try them. I just made these, and they were very good! However, the consistency came out more like quiche than like bread. I’m not sure if that’s how they are supposed to be, or if I messed up somewhere. It sounds like you may have needed some extra coconut flour. These should definitely be bread-like. Some coconut flours don’t behave as well as others. If this occurs, simply add an extra tablespoon of coconut flour at a time. These are amazing! 5 stars!! I made the most basic version to start, but I can’t wait to start tweaking the add-ins for different occasions! Even the picky hubby is requesting more! Excellent!!! One Reader has told me she adds chopped spinach to hers. I am trying that next time. Can I make this as 1 large loaf ? Libby! These are fabulous! I added some raw spinach to the batter. I worried it would add too much water, but it did just fine! My batter was lumpy in the beginning b/c I didn’t soften the butter enough. So I zapped it with my hand mixer on high speed and watched it smooth out and thicken up. Brilliant. Genius addition. 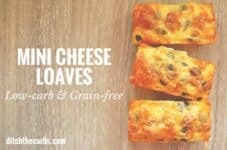 I’m going to steal this idea next time I make the cheese loaves. These are fantastic thanks Libby! I’ve been meaning to try them for ages and finally got around to it this weekend. My first time ‘baking’ with coconut flour – it was so fascinating to watch the mix continue to thicken as each successive egg was added! They are a fantastic addition to my workplace lunchbox. It’s bizarre isn’t it? Coconut flour seems to thicken the more eggs you add, then it swells and looks like regular cake batter. I’m so glad you enjoyed it. I have a Phillips Air Fryer a d would like to know what temperature did you use and for how long, I do have the baking tin. Made these for myself but dh LOVES them! He loves almost everything low carb and keto I make but he is anything but! These were really yummy! Definitely going to be a regular for me. Do I need to whisk the eggs before I add them? 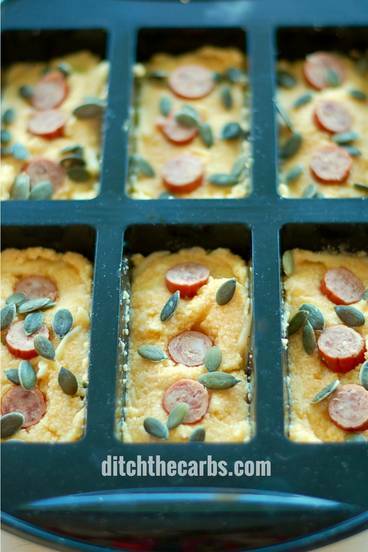 Can I make these in the microwave instead – the base, without bacon, etc? Use with any dip; salsa or marinara. How many ounces or grams was the stick of pepperoni? I made these today! I put half of the base ingredients into each of two bowls. One bowl got a little salt and pepper and just the cheese for cheese muffins, and the other bowl got a tiny bit of brown sugar and blueberries. Muffins instead of mini loaves because that’s what I have. I did use papers and they did stick some even with spraying with cooking spray. I think next time I might skip the papers. The blueberry ones were for my wee one. She ate TWO for lunch! I was pretty excited to feed her a protein-and-fats muffin instead of sugar and white flour! I’ve been mostly eating plainer whole foods since I started keto, but a cheese muffin with breakfast today was a nice treat. I’m so sorry, but not for this recipe. This is a good article to read, Coconut flour vs Almond flour. Excellent recipe and very filling! I included chopped bacon; I used 10 x 60g eggs; 75g of coconut flour; A slice of fresh mozzarella cheese in the middle of each loaf space; 185g grated cheese; 140g butter; dash of cayenne pepper; garlic & herb powder; 1 large sting onion and topped with black olive pieces prior to extra grated cheese placement. The extras resulted in producing 12 mini loaves. I found that I needed to cook for 20 mins extra. They turned out well and tasted Devine. Other changes I may make could include sundried tomatoes or alternatively make a sweet loaf by including dried fruits or frozen berries. Can’t wait to try this recipe! I read all the comments to improve my outcome. Might even try to slice and toast one for breakfast next day. I am new to this low carb lifestyle. If not loaves, how have you made them? could I substitute some ricotta cheese for some of the eggs ???? I’m not sure if that would work because the eggs are necessary for the texture, volume, structure, protein which makes it bind well with the coconut flour. If you do try, come back and tell me how you got on. How big are the individual loaves? Many pans to choose from….thank you! Just made these cheese pepperoni loaves. Absolutely gorgeous really tasty. I was very surprised as l have never used coconut flour before how easy to make. Thank you for recipe. a cream shallot for the whole recipe? Hello from NZ. I use half a spring onion. Feel free to add more or less to your liking. I love the little taste it adds to the muffin mixture. Does your Nutritional facts include the pepperoni and pumpkin seeds? I had a go at making these. The eggs and flour seemed to curdle and separate – I did add the eggs one at a time. What should the batter look like? I then cooked them in a metal muffin tin. They rose, but when I removed them from the tin I was left with a pool of fat under each one and a loaf that was more like a crunchy omlette (albeit a rather tasty one !) – than anything remotely like bread. They also sank immediately. Where did I go wrong ? Hmm, something pretty hideous is at play here. I would go back and look at your coconut flour. This mixture shouldn’t curdle at all, and that will be the reason why it had fat at the bottom and it was crispy. The ingredients have clearly separated. I make these weekly and each time they work brilliantly. Try another brand of coconut flour and see the difference. These tasted like an egg on the go cup. Pretty tasty, but not bread or muffin like. Won’t make again. Yes, and that’s a great question 🙂 If you have thought it, no doubt others have too. Hello Libby, you give so much and ask for very little. your ideas are great, thank you for doing this. and helping others. 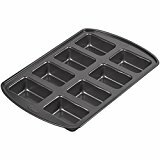 May I ask, instead of individual ones, can I make one big loaf in a loaf tin? would I need to change recipe in any way? 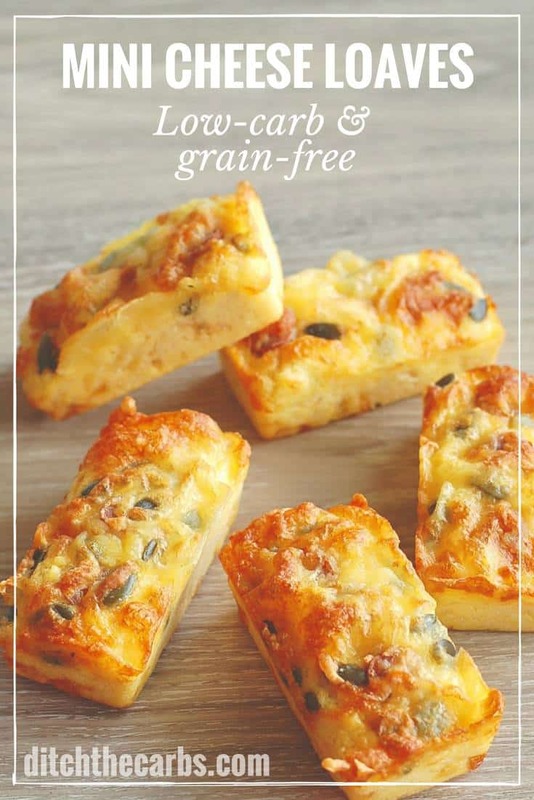 What an absolutely lovely comment “you give so much and ask for very little”, sending big low-carb karma your way 🙂 You could bake this as one large loaf, the baking time would depend on how deep the loaf mixture is in the baking dish. Coconut flour can sometimes be a bit fickle to cook throughout if it is too thick. Hence me usually making little loaves, slices and two layer cakes. But let me know if you have success and come back and let us know the cooking times and size of dish you used. These are amazing! Been on Keto for a while I miss having muffins. I’m originally from New Zealand, currently living in Dallas and these remind me of Alison’s Holst Champion Cheese Muffins which were a staple in our house growing up. Thank you so much for creating this recipe. I added diced ham and parsley. Sprinkled paprika on top before baking. Delicious!! Hello can you please convert the grams to cups/tablespoons for me for the ingrediants that show g only. 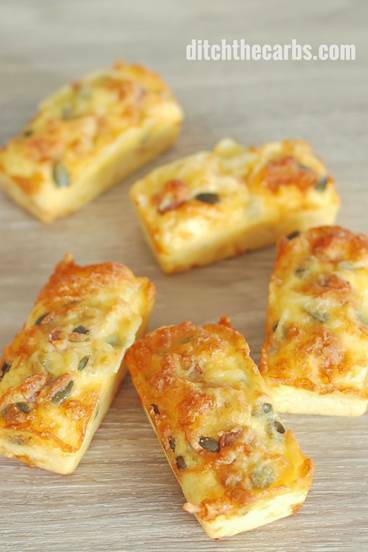 I made these on the weekend with bacon and too much cheese, cos I was slack and didn’t measure it, but they turned out really well. Great for breaky. I got my silicon moulds from KMart too for $6. Bargain! Thanks Libby for another fantastic recipe! Hi, can you use fewer whole eggs and add some egg whites to make up the liquid that is needed for the coconut flour? Thank you. Hi Libby, we had the green problem too. Are they safe to eat? Also can I make them less eggy, as we found them. It appears that is may be the aluminium reacting to the coconut flour. 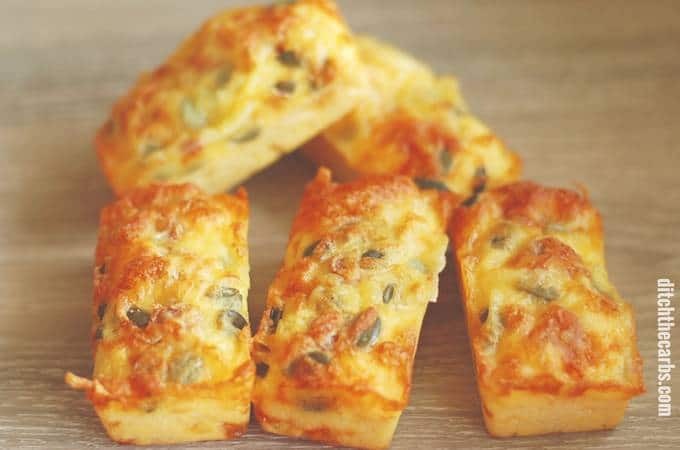 To make them less “eggy”, remember to add plenty of cheese and herbs. That is my number one tip for using coconut flour. The same goes for sweet recipes, adde xtra vanilla or cinnamon and that seems to overpower the eggy flavour. I just made these. They are delicious, I have had to stop my self from keeping on eating them! Love the texture. Thank you – your recipes rock! Can you use something besides coconut flour? my husband can’t have it. Hi, I love this coconutflour breads. But I have the problem that the lower half of the loaf gets green. I suppose these are the egg yolks. Any suggestions what to do to avoid this? I have heard some coconut flours are reacting with the aluminium in baking powder. Maybe see if you can buy aluminium free baking powder and see if that stops the green! I use parchment paper for all coconut breaking…it seems to keep the green and the sticking problems at bay. Is the baking powder necessary? I was about to make these then realised I don’t have baking powder but baking soda so rather than switch them I was wondering if I could omit the baking powder instead? Baking soda is stronger than baking powder, so you would need different amounts, and it usually needs something acidic to react with (like buttermilk). If you don’t have an acid in the recipe, it might leave a taste in the mouth and it might not rise…. Hmmm…. I wonder if you made jalapeno bread…. So, you might need less baking soda (1/4 tsp or something and maybe a splash of vinegar or something like that. Yay Chrisitne, I bought my mini loaf silicon ‘tin’ from good old Kmart for about the same $, gotta love a bargain. I keep mine in an airtight container for 2-3 days. If the weather is warm, I keep them in the fridge as they have a high egg ratio, to keep them fresh. Mine measure approximately 5cm x 10cm. 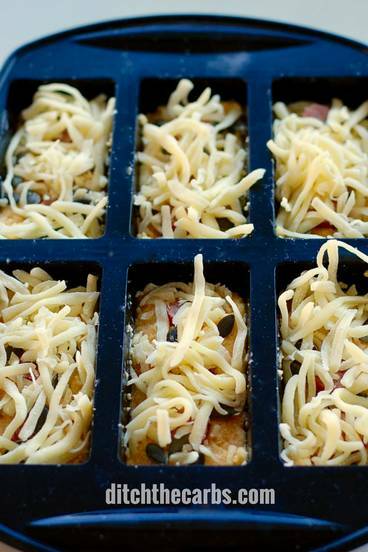 Muffin tins work well too. 45 grams of flour, I don’t have a scale, what does that equal to approximately? Hi Siry, 45g is equivalent to 1/2 cup. On many of my recipes now you can click below “Metric – US Customary” and switch your view to metric or US measurements. I am slowly ploughing through over 200 recipes and updating them all. Hello, I have been trying to figure out what the grams convert to for US measurements. Have you had a chance to convert this recipe? I don’t want to guess and have them be a flop. Need to know what 113 g butter is equal to? 50g coconut flour? 100g shredded cheese? Thanks in advance. The country I am residing does not sell coconut flour. Can I grind dried coconut meat instead. Any suggestions. I’m sorry but if you grind up coconut meat, you will end up with coconut butter. Coconut flour is the dried coconut meat with all the moisture and much of the fat removed. Hi Libby. Are you sure the oven temperature of 250 degrees is correct? I do not have 250 on my gas oven. In fact, the lowest it goes is 260. What would the baking time be for 260 degrees. Many thanks for all you do.